Like anything mechanical, machines require some care and service and watches are no different. Even with quartz battery powered watches, there is still some care and maintenance required in order to keep your watch running reliably. 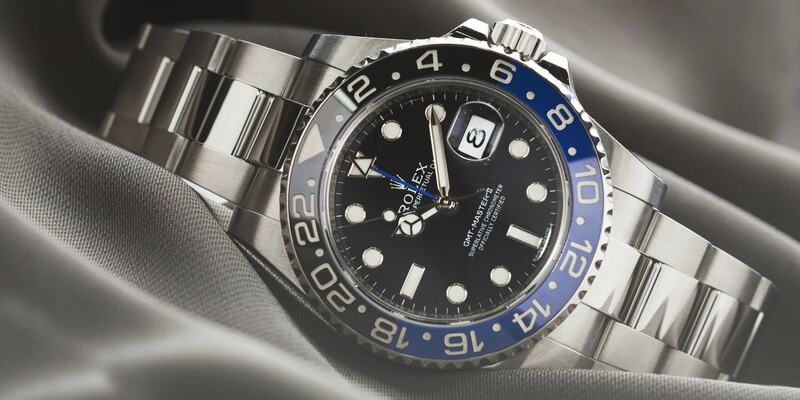 With all watches, including Rolex, it is good to keep your watch clean. Each day, give your watch a simple wipe down to remove oils, salt and the basic smudges that watches attract. Watches are similar to eye glasses in this regard that in order to use them effectively, the crystal and glass needs to be clean. A number of household cleaners are available for watches. Some people use simple dish soap and warm water whereas others use specific watch cleaner. For day to day simple cleaning, dish soap, hand soap, or some other kind of liquid soap works fine. Be sure to completely rinse the watch to remove any soap deposits. For stainless watches, some people use a dab of tooth paste to remove oils and smudges. Toothpaste can be abrasive, but the same chemicals that reduce plaque and tooth gick also work well on watches. One household product that works well on stainless bracelets is Scrubbing Bubbles bathroom cleaner. Although this is a pretty harsh chemical, it works wonders on stainless bracelets almost bringing them back to new (minus any wear scratches). Another type of watch cleaner is made by Veraet. It is a watch soap that is less harsh than Scrubbing Bubbles and designed specifically for watches. Inspecting the watch for water leaks and any other cracks, bent springbars, or loose screws. The safest place for a wristwatch is on the wearer’s wrist. Numerous watch crystals are broken when the watch is dropped, removed for showering, or just when stored. Perhaps the biggest enemy of watch are floor tiles. When removing your watch to clean it, be sure that there is not much free fall space, especially when your watch is soapy slippery. Be sure to have a routine for washing your watch, where to wash it, where to place it, towel or Veraet suede close by to dry it, etc, so that there no broken crystals. While washing your watch, be sure to inspect it for leaks. Even though Rolex and other watches are water resistant to 100 meters, be sure to inspect the watch for moisture below the crystal, as well as looking for any cracks in anything soldered, especially the bracelet clasp, and check for any loose screws in the bracelet or clasp, and check that the watch strap moves freely around the springbar. All of these neglected items can cause a watch to fail or fall off and break/get lost. If there is fog in the crystal, be sure to have your watch serviced. Even thought the watch is still running, there is corrosion going on inside the watch. Despite the watch case being stainless, gold, platinum, titanium, or even plastic, the inside is not. The parts inside the watch rust easily and quickly with any moisture. Move the bracelet or watch strap around the clasp, as well as the watch head to make sure there is not any binding. If the strap binds, there is a good chance the springbar is bent. Like with the inside of the watch, springbars can corrode, bend and/or rust. Springbars require maintenance and are typically the weakest point in a watch strap if not maintained. In Part II of this article, we’ll explore other items to check while maintaining your watch such as the seals, noises, and winding, and timing.